Cosmic coincidences lead to the meeting of Chileans Sarita Gálvez and Camila Marambio in Melbourne. Their shared reverence for the ancestral flautón chino from the Andes Mountains lead to playful explorations of its unique dissonant sounds and thereafter to experimenting with atonal signing and other technologies of the spirit. 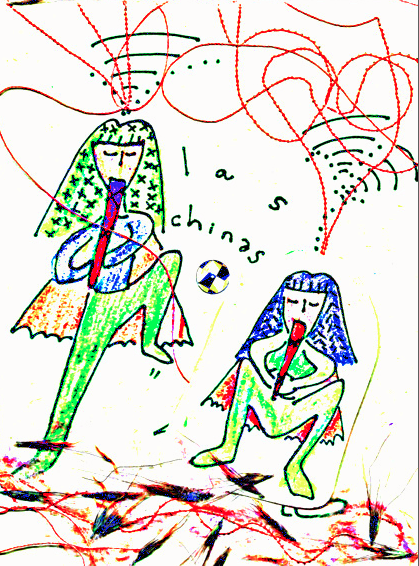 Influenced by Chilean feminist poet Cecilia Vicuña, the now deceased poet Fidel Sepúlveda, the musical ensemble La Chimuchina and the chino bands from the townships of La Canela and Andacollo, Las Chinas honours the ancestral tradition by enacting the principle of tearing each other apart.